I cannot believe it was a year ago today that my baby sister and I were at the airport getting ready to set off on our crazy adventure to Vietnam… Wow..
Travelling with my little sister was actually really awesome! She might be 6 years younger than me, but we have SO much in common, and she’s one of my best friends now that we’re both grown up. I don’t look at her as my little sister any more. She’s my friend. I go to her with my problems, I ask for her advice, I look up to her, and I trust her. I always hope that I’m a good enough big sister to her, and hope she knows I’ve always got her back, too, just like she’s always had mine. Getting to travel together was such an amazing experience for us both; we got to actually spend time together as friends, as equals, not as big and little sister! I think that travelling with someone is the best way to really get to know them, and I’ll be forever grateful for that time we had together, getting to know each other as adults, not as kid siblings. We had the most amazing time in Vietnam, a lot of which I’ve written about here, and I’m currently already planning another trip back some time next year. Of all the places I’ve visited, Vietnam has been one of my favourites. Incredible food, lovely people, a deep history, a rich culture, and beautiful, lived in streets full of places like this one we found in Hanoi. A meal in Vietnam is a beautiful thing. It’s an opportunity to spend time with family and friends, to catch up and chat and laugh. It’s a time to order up and share food on little plastic stool and table sets, served up by old women who run their establishments like bosses. And the food is SO GOOD!! The lady here served up the most amazing banh cuon I’ve ever had – steamed rice rolls filled with what we guessed was prawn and pork, smothered in fried shallots, and served with delicious dipping sauce/soup and herbs. Street food in Hanoi is some of the best in the world. I can’t wait to go back! Thanks for sharing! We are heading to this part of Hanoi tonight and will get a bite. 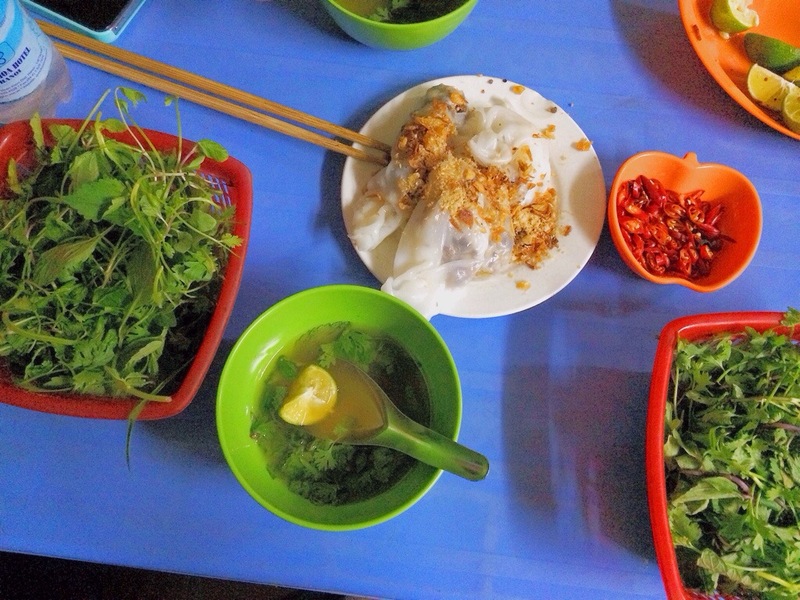 We love Vietnam as well and have really been enjoying the food! Have fun! !